This image captures swirling cloud belts and tumultuous vortices within Jupiter's northern hemisphere. NASA's Juno spacecraft took this color-enhanced image at 10:23 p.m. PDT on May 23, 2018 (1:23 a.m. EDT on May 24), as the spacecraft performed its 13th close flyby of Jupiter. At the time, Juno was about 9,600 miles (15,500 kilometers) from the planet's cloud tops, above a northern latitude of 56 degrees. The region seen here is somewhat chaotic and turbulent, given the various swirling cloud formations. In general, the darker cloud material is deeper in Jupiter's atmosphere, while bright cloud material is high. The bright clouds are most likely ammonia or ammonia and water, mixed with a sprinkling of unknown chemical ingredients. A bright oval at bottom center stands out in the scene. This feature appears uniformly white in ground-based telescope observations. However, with JunoCam we can observe the fine-scale structure within this weather system, including additional structures within it. 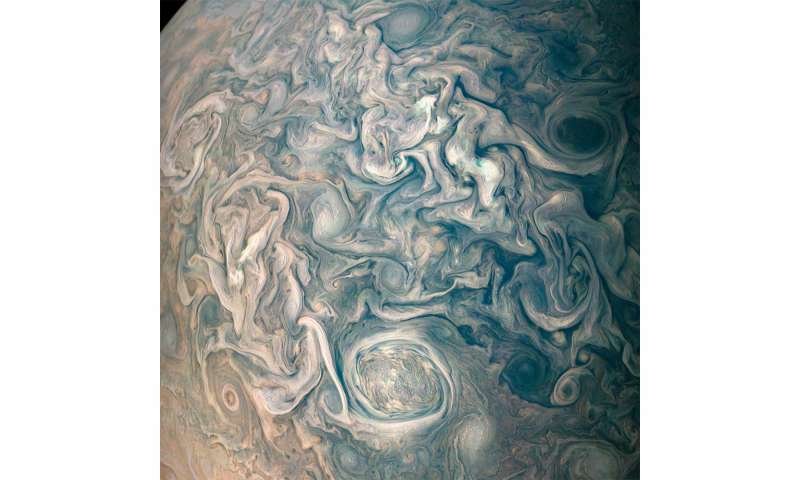 There is not significant motion apparent in the interior of this feature; like the Great Red Spot, its winds probably slows down greatly toward the center.